In 2000, after several years of research, Fred Page produced a 2 volume work on the men named on the Stanwick War Memorial. A copy of the publication, specially bound by the Simpson family of Stanwick, was presented to Stanwick Parish Council later that year. Sadly, Fred died in the summer of 2006, but as a tribute to him, his family decided to make available to a wider audience the results of his long endeavours. 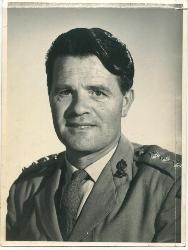 Fred Page was born in 1928 in the British Military Hospital, Karachi, the son of a Warrant Officer in the Royal Artillery. He followed his father into military service also joining the Royal Artillery. After a lengthy service he left the British Army but found that civilian life was no substitute and he soon signed up again, this time joining the Royal New Zealand Artillery. Returning to the United Kingdom after several years in the antipodes, he and his family eventually arrived in Stanwick in 1971 and by now he had taken up teaching. He joined the staff at the Windmill Primary School, Raunds in 1972, a successful association which lasted until his retirement in 1992. Fred is survived by his dear wife Valerie, two daughters (one from his previous marriage), two sons and seven grandchildren. So many people have helped in the compilation of this “book” that I hope there is no-one whose name I have omitted. 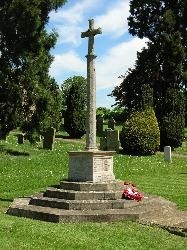 Peter Inns promptly telephoned and offered Internet access thus providing details from the War Graves Commission of 50 service men of Stanwick which became the foundation for all other information. His friend, George Johnson, using his photographic expertise was responsible for producing most of the personal photographs from very old newspaper cuttings. Gordon Hall of Wollaston, a member of the War Research Society, made his encyclopaedic knowledge of the First World War readily available for many of the historical facts I needed. Gordon also obtained for me many photographs of gravestones and memorials. Mike Conroy of Wellingborough, telephoned to advise me of the vast source of information available from old newspapers in the office of the Evening Telegraph in Rushden. The ladies in the “Evening Telegraph” office were most helpful, as were the staff of the Northamptonshire Library Service who obtained many books for me. Mr Sid Barker, Stanwick (Pte Barker & Pte Dickerson); Mrs Chapman, Stanwick (Foskett brothers); Mr David Rogers, Raunds (Pte Harrison); Mrs Parkin, Stanwick (Pte Robins); Mr Arthur Popham, Stanwick (Ptes E H & J G Morris); Mr Watford, Raunds (LCpl Watford); Mrs Randa Wright, Stanwick (Pte H Warner); Mrs Turvey, Stanwick (Gdsman Baldwin); Mr Michael Johnson, Raunds (LMM Johnson) and photocopying; Mr Morris, Rushden and Mrs Loveday, Irthlingborough (Pte L Morris); Mr Phillips, Stanwick (Pte Phillips); Mr Ivan York, Ringstead and Mrs Lilley, Raunds (York brothers). Naval Historical Branch; Royal Artillery Institute; The Queen’s (Royal West Surrey Regiment); The Buffs (East Kent Regiment); The Norfolk Regiment; The Suffolk Regiment; The Bedfordshire Regiment; The Royal Inniskilling Fusiliers; Duke of Cornwall Light Infantry; The Essex Regiment; The Northamptonshire Regiment; The Royal West Kents; The Middlesex Regiment; The Royal Irish Fusiliers; Mr Jim Parker (Machine Gun Corps); RAF Museum (Hendon); The Commonwealth War Graves Commission. Mr Cliff Pateman helped greatly pin-pointing the houses where many of the deceased lived. Mrs Janet Cutmore used her “Down Your Way” column to help in my research. Mr David Thoday arranged the loan of P/O Clarke’s Log Book. Mr Jack Morris for information. Mr Newton, Headmaster of Stanwick School for allowing access to the school’s Log Books and Registers. Stanwick Working Men’s Club for the use of their Minute Books. Miss Shirley Haygreen for internet contact to Canada. Mr George Durrant, help with facts, pictures and diagrams of the Northamptonshire Regiment. DTL Colour Graphics, Rushden for friendly service and help with reprographics. Ray Westlake, Military Bookseller for information regarding Divisional Signs. Thanks also to Stanwick MM Committee for part finance and photocopying. To Simon Page, for the trip to France. Finally, as always, it is to Valerie, my wife, not only has she done all the typing , she has sustained me generously with interest and encouragement, advice and objective criticism. * June 2013 - the webmaster would like to thank David Killick for the photographs of Arthur Burton and Enos Owen Coles which have now been added to this website. * January 2014 - the webmaster would like to thank Gail Terry for the long sought after information on Stanley Tomkins, whose identity on the WW2 Roll of Honour could only be provisionally made by Fred during his research. The "Acknowledgment" section on this page and all of the items on pages 2 to 5 are in Fred's own words. This website is maintained on behalf of the Page family by their "webmaster", should you have any queries or comments on its content, please e-mail freddieshawm@btinternet.com. No part of this website may be reproduced without the express permission of the webmaster.